To mark Saudi National Day on the 23rd of September, the General Entertainment Authority presents one of the largest custom-made events by the world-renowned company Cirque du Soleil, organized by MBC Group. The record-breaking performance – which will feature Cirque du Soleil’s largest number of circus artists ever assembled for a special event – will get underway in a visually stunning world to celebrate the 88th Saudi National Day and a future ‘Beyond the Horizon’. The production exclusively designed for this occasion, will take place at the King Fahd International Stadium in Riyadh in front of 27,000 attendees – making it one of the biggest Cirque du Soleil productions ever created for a customized event. A tailor-made 85 x 40-metre stage has been designed and constructed especially for the occasion. The production will blend the latest technological innovations in stagecraft, large-scale video projections, special effects, and fireworks with Cirque du Soleil’s signature style acrobatics. Intertwining storytelling with spectacular acrobatics, viewers can look forward to aerial silk, suspended pole, rotating ladder, German wheel, fire manipulation and trampowall specialists, a group of unicyclists, a troupe of contemporary and hip-hop dancers, electric motorcycles, and even a free-flying Hoverboard. 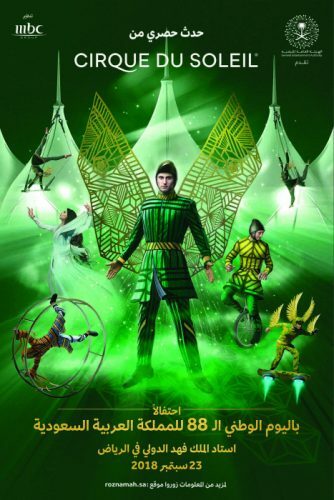 “This upcoming Cirque du Soleil event will provide the Saudi audience with an enthralling international entertainment experience, mixed with locally-relevant content,” said Abdulrahman bin Nasser Al Khalifa, General Manager of Communications and official spokesperson of the General Entertainment Authority. Al Khalifa said the event is part of the Authority’s efforts to attract the largest entertainment and leisure companies to the Kingdom, adding that these efforts will support the local sector. Show Synopsis: As the sun sets on the horizon, a tribe of nomads gather on the dessert dunes in search of an oasis when a raging sandstorm sweeps across their encampment. The desert dwellers are whisked off to a surreal world and the wheels of the future begin to revolve. The encampment turns into a magical oasis where waterfalls flow upwards, and when the great falcon spreads its wings, a new sun rises over the horizon. Set Design: The visual theme of the King Fahd International Stadium’s exterior is reminiscent of Bedouin tents. This design will be explored on stage as well, thus creating ‘a theatre within a theatre’ experience. The four elements will come into play with the tent structures and four enchanting mashrabiya-inspired lanterns to immerse the audience in a surreal realm where tradition inspires the future.